In our first column about podcasting, we discussed microphones, and the other accessories required to record voices for a podcast. The next crucial technical element is software: for recording into, and for editing and mixing a final production. Transom has many articles about different audio editing software, and any of these may be helpful in choosing which one is right for you, or in providing details about using it. In this column, we’ll concentrate on how the various software is more or less appropriate for podcasting. Of course, a podcast is not fundamentally different from any other audio production, and so the sophistication level of your content will help determine what software is best for you. Many podcasts are structurally fairly simple, based around one or two voices, perhaps with cutaways to music or clips of other audio, maybe with theme music that gets layered under the voices. More elaborate productions, with multiple elements and special effects will likely need one of the more complex software packages, but the good news is that a basic production can be made with simple and inexpensive software. Why record into a computer? You don’t have to. You could simply employ a small portable audio recorder, especially for certain circumstances, such as conducting an interview at a subject’s house or office, or recording at a live event. There are many recorders that would work for this, but keep in mind what you need the recorder to do. If you’re recording a simple interview, you’ll get the best results using an external microphone, not the built-in mics on small handheld devices. Ideally, you might want to use two microphones, one for the interviewer and one for the interviewee, so you want to be sure to use a recorder that has (at least) two XLR inputs for external microphones, and, crucially, independent input gain controls for each input. Recorders such as the Tascam DR-100mkII, Tascam DR-60D, or Zoom H5 would be good choices. If you’re recording at a live event and would like to include the sound of the audience, the Zoom H5 would allow you to plug voice mics into the external mic inputs and also use the built-in stereo mics to record the audience. 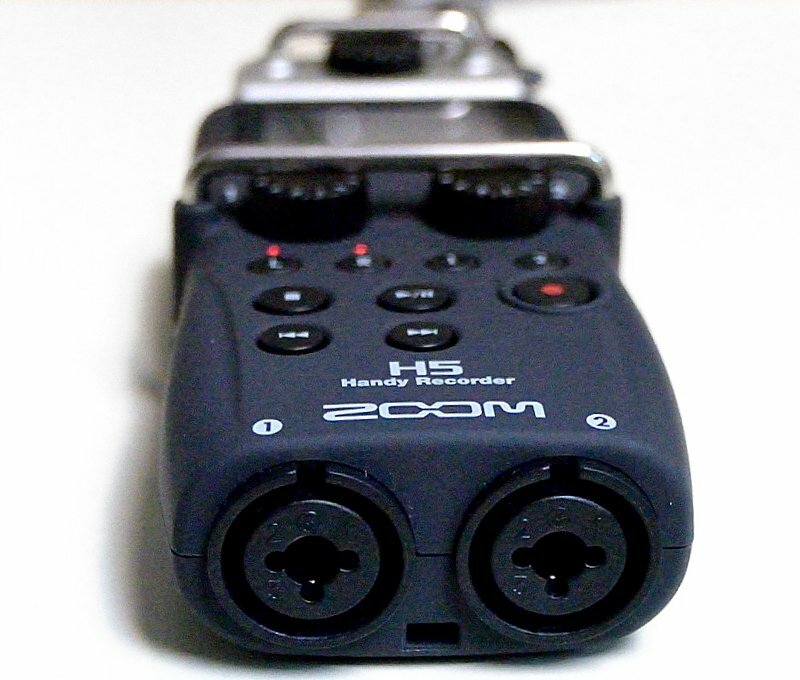 If you were to need more inputs, for more than one interviewee, or a panel discussion, recorders such as the Zoom H6 and Tascam DR-70D have four XLR inputs for external microphones (the Zoom H6 can be expanded to six XLR mic inputs with an optional module). When recording directly into a computer, you’ll want to use an external audio interface, rather than the computer’s built-in microphone inputs. Microphone signals are very low-level and need to be amplified significantly, and it’s best to do this outside of the electronically-dirty environment inside a computer. Additionally, a dedicated audio interface is likely to have better-quality components to handle the amplification and analog-to-digital conversion than the average computer. There are many different audio interfaces, with varying configurations of microphone and line-level inputs, so there’s surely one that fits your needs and budget. It’s most common for these devices to connect to the computer via USB, but there are also versions that use Firewire, Thunderbolt, Ethernet, or even WIFI. Some interfaces are tied to specific software, but most can be used with all of the most common recording and editing software. Before you buy a specific interface, check to make sure that it’s compatible with the software you want to use – AND – just as important, with your computer’s operating system. If your podcast is just one or two voices — without additional music or effects layered-in — multitrack audio workstations, free or paid, might be overkill. There are basic recording applications that can capture sound files from any valid audio source, be it an external USB microphone, or the internal audio from an application, such as Skype or other VOIP programs, a web browser, or teleconferencing/ meeting software. These basic recorders might have rudimentary editing capability as well, and processing can be added, making them sufficient for producing a complete podcast. Even if your production is more complicated, and you use a full Digital Audio Workstation to create your final project, these simpler programs are often good tools for capturing audio from computer-based processes, prior to assembling those elements in a more sophisticated editor. If your podcast is going to involve more than one or two voices, recorded in close to real-time, you will likely want more elaborate software to edit and mix your sound. Even the simplest podcast often sounds more polished with some intro and outro music, or you might want to insert audio recorded previously. In that case, you might use a multitrack audio editing and mixing program, often called a DAW (Digital Audio Workstation). There are several good editing and mixing software packages available for free. Some are open source and can be downloaded by anyone, others come with certain computers, and still others are provided at no extra cost with the purchase of other audio equipment. Although Garageband comes free on Mac computers, and is designed primarily for music-making (by assembling audio loops or playing MIDI instruments), it also works just fine as an audio recorder, editor and multitrack mixer. There are even versions of the application that will run on iPads and iPhones, and sessions can be shared across those devices and your desktop or laptop computer. As you might guess, the iOS app is not as powerful as the desktop version, so projects created on an iPad or iPhone can be opened and edited in the full version, but not the other way around. Unfortunately, Apple removed several podcast-specific features from the latest versions of Garageband: There’s no longer a podcast template to start from, nor is there a “Podcast track” that allows placement of chapter markers and other aspects of “enhanced” podcasts. But even the newest version of Garageband remains a simple platform for making a podcast: Create a new “voice” project, which brings up a variety of vocal processing set-ups in separate tracks (just pick the simple “Narration” track, delete or ignore the others, and start recording). In Garageband, you can select a USB microphone or an audio interface as the input source for a track, record multiple tracks at once, or additional tracks at a later time. You can trim the resulting audio recordings, deleting unwanted sections, and slide clips along the timeline. You can overlay music or sound effects, automate the playback volume of the tracks, and add processing, such as Equalization and Compression to make your recordings sound better. Once you’ve adjusted the elements to your liking, you can export your mix to your computer’s iTunes library, or upload it directly to SoundCloud, or to your own iCloud account. One of the most popular options is the open-source software Audacity. Our Transom review is from many years ago, so some details may no longer be accurate, but the overall operation of the program is much the same. The application is frequently updated, so be sure that you download the most recent version — a bug or quirk may have been fixed since you first downloaded it. While it’s possible to create sophisticated, multi-layered multitrack productions in Audacity, it’s best suited for more simple projects. Doing basic recording, trimming and editing, adjusting levels, and adding simple music or ambience beds is quick and easy in this program; you can even apply a wide variety of audio processing and effects (including a surprisingly good de-noise plug-in). But many of Audacity’s actions employ “destructive editing,” which is to say that once a cut or deletion is made, or an effect applied, it makes a permanent change to the audio — you can’t later return and adjust the edit, or remove the EQ or other processing. This can be a quick and efficient way to work, but it removes some flexibility. Audacity’s volume automation is not as easy to write and adjust as in many other programs, and audio metering is not implemented as elegantly as in some other programs, making it a little harder to meticulously craft a mix, but hey, it’s free . . .
Cubase is commercial software sold by Steinberg (makers of the professional-level DAW Nuendo, and other audio software) but a stripped-down version – Cubase LE – is provided for free with many audio interfaces. More sophisticated versions of the software are available for purchase. Like many Digital Audio Workstations, Cubase is oriented toward music production, but it also has all the usual tools needed for producing a podcast: non-destructive editing, volume automation, plug-ins for EQ, compression and special effects. Pro Tools is one of the most-used audio workstations in the world, from independent producers’ bedroom studios to professional facilities. Current versions of even the most basic full version of the software have become expensive, although there are upgrade paths if you own an earlier version. Yearly subscription plans are now offered too. Or — there’s the completely free Pro Tools First. We don’t like that sessions created in Pro Tools First cannot be opened and revised in the full version of Pro Tools, or that the projects are stored primarily in the cloud, not on a user’s own computer or external hard drive (although projects can be worked-on off-line,) or that there are a limited number of projects that can be worked on simultaneously without purchasing additional capacity. But, the program is free, and while projects cannot be moved into the full version, the user’s skills can, so it might be a good way to learn the program, and to see if it feels worth investing in the full version. Even this free version is quite capable: it can handle up to 16 tracks, and provides editing and mixing tools similar to the full Pro Tools, along with several useful free processing plug-ins. We’ve been big fans of the Hindenburg software since the program was first introduced. That’s partly because it’s relatively easy to learn to use, while providing lots of powerful editing and mixing features. But perhaps the aspect that we like best is that it was created by radio people, for radio people, rather than being focused mainly on music creation. That orientation toward montage-style radio-like production naturally lends itself toward podcasts as well; in fact it has several built-in capabilities focused specifically on podcasting. Metadata for basic audio file info, or enhanced podcasts can be easily edited and embedded in the sound files from within Hindenburg. The Pro version of the software includes utilities for exporting and uploading audio files to FTP sites with a single click. Hindenburg can even update a podcast’s XML file automatically. Audio can be directly exported and uploaded to other destinations, among them SoundCloud and PRX. Of particular interest to podcasters: version 1.5 of the software allows recording from multiple sources — such as more than one USB microphone and/or audio interface — without reconfiguring the computer’s audio inputs at the system level, and without conflicts from varying sample rates or clocks. We’ve come to rely on the program’s built-in loudness controls, making it easy to arrive at consistent audio levels, as well as its quick and simple editing and mixing tools. Hindenburg 1.5 also adds an option for loudness-normalization upon file export, meaning that the user can be sure that the levels of all files they export will be adjusted to meet loudness standards, including the increasingly-accepted podcast standard of -16 LUfs. These new features are included in the Pro version of the software, which also has a very easy-to-use Skype call recorder built-in, a real time-saver if you do lots of Skype interviews. Even though some of the most impressive features are reserved for the Pro, and Broadcast, versions of the software, the less-expensive basic version of Hindenburg includes automatic leveling in the workspace and very easy-to-use editing and mixing functions, and is a very capable tool for podcast and radio production. Cool Edit was a popular audio editing program for radio production. Adobe purchased the program and renamed it Audition, and has gradually added features over the years, so that it now is a very sophisticated, fully-featured audio workstation. The program has lost its appealing simplicity, but it’s still oriented more toward making documentary-style audio productions than many other music-focused workstations. Audition has very sophisticated editing and mixing tools, and includes a wide array of built-in processing plug-ins. 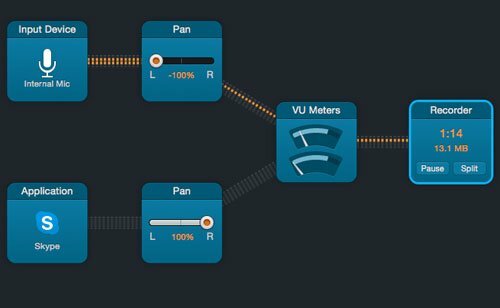 Of particular interest is a powerful and effective broadband noise-reduction plug-in. That functionality usually requires an expensive third-party plug-in when using other audio workstations. The program even provides a helpful podcast session template that sets up an audio track with useful voice-processing plugins. Audition includes many ways to adjust audio levels, including a very clever “Match Clip Volume” function that can quickly align audio levels to accepted loudness standards. Like many of these fully-featured (and expensive) multitrack audio workstations, Audition might be overkill for creating a basic podcast, but for productions that require fine editing, processing and compiling of many elements, the power of a program such as this can be very helpful. Like most Adobe programs, Audition is available now by monthly subscription as an individual program, or as part of the Creative Cloud bundle that includes many popular media editing tools, such as Photoshop and Premiere. It’s a little frustrating that there’s not an option to simply buy the software outright, rather than signing-on for endless payments, but at least the initial threshold for beginning is lower — there’s no dauntingly large purchase price dissuading you from getting started. Even better, there’s a free 30-day trial, so you can see if the application fits your workflow. Like Adobe Audition, a full Pro Tools system could be considered overkill for the average podcast production. The price for getting even a basic Pro Tools system has greatly increased; the software alone sells for almost $700, and it’s no longer bundled with an audio interface. Pro Tools has become much more flexible in the last few versions, allowing the use of a wide variety of hardware interfaces, adding faster-than-real-time-bounces (finally) and adding more importing and exporting options. Unlike Audition, Pro Tools does not have any built-in noise reduction capabilities, but it does come with an array of quite capable plug-ins for EQ, compression, and special effects. Pro Tools has the distinct advantage of remaining something of a standard in the professional studio world, so projects can be easily moved between professional studios, and more casual production facilities. Pro Tools editing and mixing functions are quite sophisticated, and expertise on this program is a very practical skill in the professional audio production world. Many radio producers have found that REAPER has all the editing and mixing power of a program like Pro Tools, but at a much more affordable price. A basic individual license is only $60, and even the full license for larger-scale commercial work is only $225. REAPER does indeed have all the power of any of the modern audio workstations, although the interface might not be quite as slick and polished as some. Like similar workstations, REAPER might be more complicated than is necessary for the average podcast, but it’s nice to have options available when needed. A large number of processing plug-ins are available, many created by users. In fact, the program itself is broadly customizable by those using it, and is constantly being updated by both the original developers and a wide community of users. There are many more audio editing and mixing applications that would be perfectly good for creating a podcast, including Garageband’s big-brother Logic, the full version of Cubase, Cubase’s professional relative Nuendo, Cakewalk, the list can go on and on… If you can record, edit and mix audio in it. and you’re comfortable with it, you can use any application you want. In the end, it doesn’t matter what hardware and software you use, it’s the result that counts. Your content is the most important element of your production, but you also want to record and mix your podcast in a way that makes people want to listen. Distortion, hiss, bad EQ, and wildly fluctuating levels are distracting and annoying, and will dissuade listeners from sticking with your podcast. So, get a decent USB mic, or even better: a good analog announce mic and an audio interface. Listen on headphones when you record yourself. Do you sound thin, distant and echoey? Get closer to the mic. Are you getting distorted popping P sounds and crunchy S sounds? Back-off the mic a little, place it a little off to the side, at an angle, and get a decent pop filter. There are articles here on Transom. Many software companies offer tutorials available on the web, or included with your software purchase. And of course, there’s an endless supply of lessons on YouTube. Sure, some of those videos were made by people who know less about the programs than you do, but there are some very helpful guides too. Edit! Once your elements are recorded, be critical: did you go off on a pointless digression? Did that joke fall flat? Did your cell phone ring, or your dog bark while you were recording? Cut those bad parts out. Did you cough, bump the microphone, pause a bit too long while you tried to remember that name? Clean it up. Digital audio editing programs make it quick and easy to remove sections of audio that distract from your purpose. Watch your level meters when you record: You want to see a healthy signal level, but you don’t ever want to see the red “over” indicators light up. If they do, your sound will probably be distorted and you need to turn your input gain controls down. If you don’t see much signal indicated on the meters, the resulting sound file will be too low, and it may become noisy as you raise the level later. In a future column, we’ll go into more detail about how to mix multiple audio tracks together smoothly, and how to keep your audio levels consistent throughout your podcast. But if you’re using Hindenburg or Audition, take advantage of their loudness-based clip-leveling functions. If you’re using other programs, use a loudness-based audio meter to monitor your levels, and make adjustments based on those readings. Our article about Loudness explains that the standard for Public Radio has been declared to be -24 LUfs, but there’s no “official” level for podcasting. That said, there’s increasing acceptance of -16 LUfs as a standard for podcasts. That’s louder than the Public Radio broadcast standard, and may require the use of compression or limiting of peaks in order to reach that level. We’ll give you more tips on using those processes in a future column, but in the interim, take advantage of your DAW’s capabilities — some of them have loudness-based normalization built-in, and can automatically export your project at your desired level. Yes, it’s “only” a podcast, but when recording your original tracks, either in a studio or in the field, record .WAV files, not .mp3 or AAC, or another compressed format. Record at 16-bit, 44.1 kHz. There’s nothing wrong with recording at higher sample rates or bit depths, but they take up more disc space and require more computer resources to process, and those higher resolutions don’t ultimately benefit you much when your final product will be eventually crunched down to an MP3 or AAC. For efficiency of storage and delivery, your podcast will ultimately be delivered in one of those compressed file formats, but you should keep the resolution of your original files, and of your project, at a high level, and only convert to MP3 or AAC as a final step. When setting up your session in your audio editing program, define those audio parameters as described above: .wav file, 16-bit, 44.1 kHz. Again, there’s nothing inherently wrong with using 24 bit, or 48 kHz, or 96 kHz, or even higher, but the increased file sizes don’t result in much better sound when your final product will be a relatively low-resolution MP3 or AAC. Once you’ve recorded your tracks, cleaned them up, added any additional elements and adjusted their placement and volumes, output your mix. Podcasts need to be distributed as compressed files, the most widely-accepted formats are MP3 and AAC. The quality settings are up to you, but as a rule, smaller file sizes are preferred, so go with the lowest encoding rate that still sounds good enough to you. 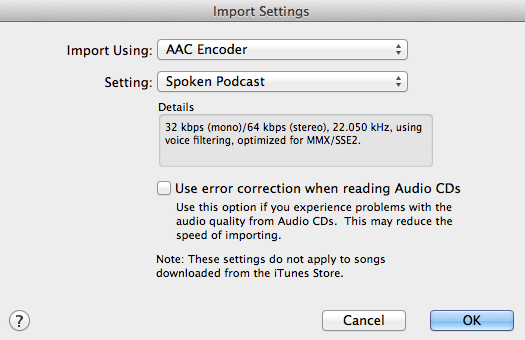 If your podcast will sound fine in mono, export, and encode, in mono: the resulting file will be only half as big as a stereo version. We recommend keeping the file at 16-bit and 44.1 kHz, and experimenting with different compression settings in your MP3 or AAC encoder, but some voice-only podcasts can sound OK at lower sample rates or bit depths. It’s always a good idea to export and save a full-quality version of your production as an uncompressed WAV file. You may want to make simple changes or updates to your program and in some cases it might be easier to tweak a mixed version than to go back and re-adjust the elements of your original multitrack project. Also, the technology of audio delivery changes, so at some time in the future, you may want to re-encode your production in a different format, or using newer software. If so, you’ll want to start with an un-compressed, full-bandwith version, not a compressed file such as an MP3, which would likely not tolerate transcoding to a new compressed format as well as a WAV file would. Once you’ve created the MP3 or AAC version of your podcast, you can upload it to your own website, or to Soundcloud, or some other podcast hosting service. We’ll discuss options for hosting and syndicating your podcasts in a future column. For more about microphones and audio interfaces for podcasts, be sure to read our column: Podcasting Basics part 1: Voice Recording Gear. Another terrific article. It’s hard to find answers to simple questions on audio when the web is crowded with either self-anointed audiophiles or technicians. So often people carry on about the *best* quality in any situation rather than what works in a given situation – like podcasting. Hi. I’m working on my first audio story and working in Hindenburg Pro on a Mac. I’m having the hardest time saving files that don’t get compressed and saving clips. Is there a community site I can go to for answers? Hi. I found this tutorial, AIR presents: Hindenburg Unpacked – Work Flow (third in a series with Jeff Towne), to be the best introduction to HJPro. Air also has other resources on both their site and on their Vimeo page, which is where this tutorial is hosted: https://vimeo.com/57684832. It should answer your specific question, and also provide you with some great ideas for organizing your projects. I have an ready-to-go mp3. I have Audition. How do I get Audition to spit out a podcast-format file that iTunes/Overcast/etc. will recognize? It’s probably worth noting that Pro Tools can now be had for around $25-$30 a month. Which puts it at a similar price point to Adobe audition. As long as you don’t need multitrack capabilities, the Sound Forge line from Sony is pretty good. Of particular note is that the higher-end versions include both native and iZotope processing. First radio piece! : I use Hindenburg, have four tracks – and have exported to mp3. I find that I hear some of the tracks in one hear, and the music in the other. Or actually loud in one, soft in the other so as to think it is mono – what can I do to hear the whole piece together equally in both ears/headphones? In Hindenburg, highlight a problematic clip by clicking on it so it turns orange. Then from the Tools menu at the top of your screen, choose “Split Stereo.” BUT! before you do that, make sure there’s not another audio clip in the track directly below it, because the Split-Stereo process makes a new mono clip on the track directly below, and you could end up accidentally obliterate, or at least interfere with, the audio below. To be safe, you could make a new empty track right under the one you’re working in. After you’ve split the slip into the two mono clips, you may be able to easily see which one is the better quality, but if not, solo each track and listen to each mono clip and see which one sounds better. Delete the other one. Now you have a true mono clip, which will sound like it’s exactly in the center of the stereo spectrum, if your pan control for the track is exactly in the center. You may need to re-adjust the volume of the clip. Hope the helps! Some audio recorders always record a stereo file, and if the left and right inputs gains are a little different, it can create a file that seems tilted to one side. Sometimes this is an intentional recording scheme, to provide a lower “safety” track in case the primary track gets distorted from a loud peak. But if you’ve recorded that way, you should definitely always split the stereo recording into two mono clips, and only use the one that sounds best.